Lancefield is a rural township 62 km, north-west of Melbourne, about mid-way between Kyneton and Kilmore. It is overlooked to the north by the Cobaw and Mount William Ranges. About 1 km north of Lancefield there are the headwaters of the Deep Creek, where a shallow ford was used by travellers. By 1859, a hotel and store were opened near the ford. 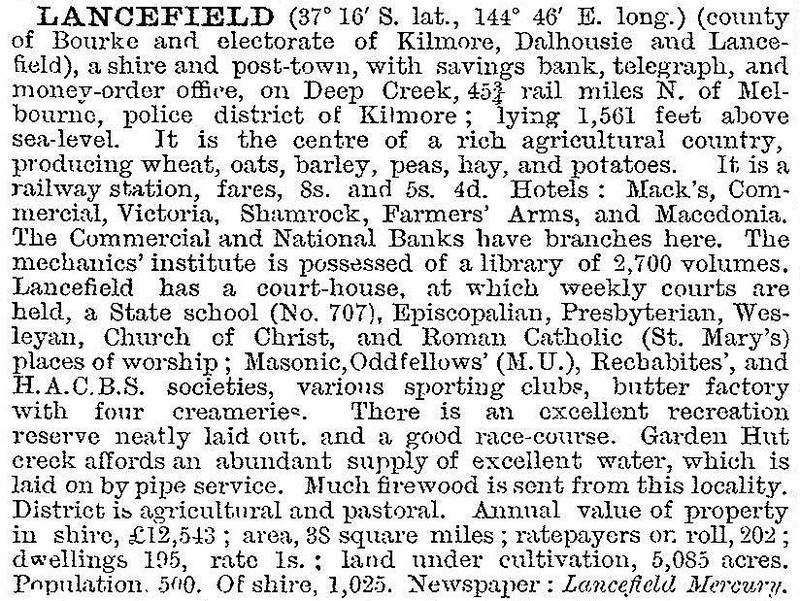 The hotel was named the Lancefield, after the Lancefield pastoral run which had been taken up in 1838. Southwards, in the future township, another hotel was opened in 1862, and a school was opened in 1865. In 1869 Francis Foy and his family resided at the corner of High and Foy Streets. He was the brother of Mark Foy who later established the Foy and Gibsons chain of department stores. Francis set up a drapery store in Lancefield, which traded under the name Mark Foy (his son). Between 1865 and the mid-1870s several civic and religious institutions were opened in Lancefield: the school (1865), Anglican church (1868), Presbyterian church (1876) and the mechanics’ institute (1877). During the 1880s a railway line from Clarkefield was opened (1881), a Catholic school was begun (1885) and a water trust was established. A second railway from Kilmore was opened in 1892, but closed in 1904. It was costly to build and carried little traffic or freight. Until 1890 Lancefield was in Romsey shire but on 10 January it was constituted a separate shire along with part of the Rochford district. The Lancefield shire had a life of 26 years, until it was reunited with Romsey shire on 31 May 1916. Lancefield and Romsey were about equal in population. Romsey was the administrative centre of the shire, but Lancefield had the hospital (1919) in the former Commercial Hotel. The closure of the Kilmore railway lessened use of the line from Clarkefield until its closure in 1956 and the situation of Lancefield between the Calder and the Hume Highways kept it apart from major transport corridors. Until 1970s it settled into a placid existence with farming, local sports fixtures and fulfilling the role of a local service centre. The opening of Tullamarine Freeway in 1970 brought Romsey within commuting reach of metropolitan Melbourne, and some farmlands were subdivided for rural/residential living. The trend extended to Lancefield during the 1980s. The Lancefield township extends westwards from the main Melbourne to Lancefield Road. (The railway station was east of the main road, and closed in 1956). A conservation area extending one block along the north side of High Street, and across the main road to the former Macedonia Hotel, is on the Register of the National Estate. The Lancefield Swamp, near the sports ground, contains extensive mega-fauna remains dating to about 26,000 years ago, and is also on the Register. Mount William’s north-eastern slope was the site of an Aboriginal stone quarry. Stone hatchets from Mount William have been found in many parts of Victoria, indicating that they were important in ceremonial and other exchanges. The site is heritage listed. Lancefield has a Catholic primary school and State primary school (172 pupils, 2014), a bush nursing hospital, three churches, a golf course, a showground, a sports oval, a swimming pool, public halls and a caravan park. The former Macedonian Hotel is an antiques centre. In 2014 a new commercial and residential development was proposed, located on the northern side of High Street at the western edge of the Lancefield township.